The oscillating multi-tool is one of the handiest tools you can have around the jobsite or workshop. It’s versatility allows you to accomplish numerous tasks that would be impossible with other tools. You can sand; saw metal, wood, and drywall; make large holes; plunge cut into hardwood; or undercut a doorway. You can also remove grout, cut trim for new flooring, and cut off nails and screws flush. That’s just the start. We like our oscillating multi-tools so much that we compiled this list of 6 ways Pros use an oscillating multi-tool. 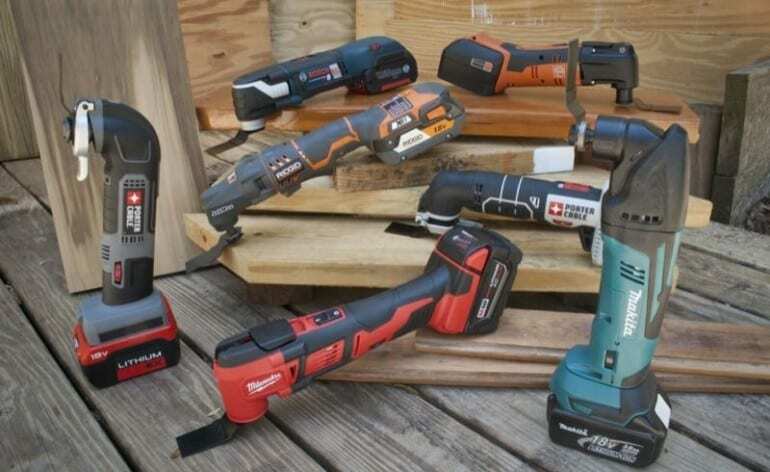 And believe me, there’s more than five…And be sure to also check out our oscillating multi-tool shootout. 1. Plunge Cuts are Easy. This is possibly our favorite of the 5 ways Pros use an oscillating multi-tool. The tool is designed for “impossible” plunge cuts. It makes them easy—if you use the right blade. 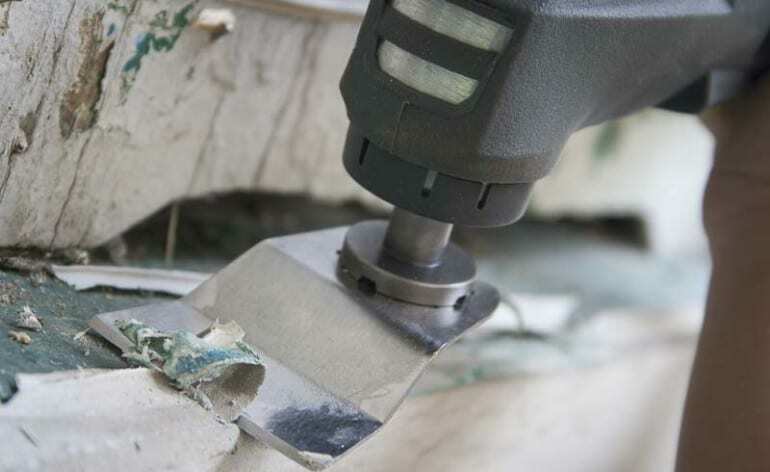 While multi-tools are commonly used to cut holes in drywall for electrical boxes, they can tackle any job that needs a plunge cut. Begin a mortise. Make a notch. Cut trim and casings for flooring. 2. Use Like an Orbital Sander. Swapping the blade attachment for the sanding attachment, you can use the oscillating multi-tool as a small detail sander. It’s not a replacement for other handheld sanders, but it will work for small areas. We like the control it gives us over the work. There’s also an abrasive attachment that’s good for removing small arms of grout or glue. 3. Flush Cuts in Wood, Drywall, and Metal. Swapping the attachment for a half-moon blade, you can easily make longer cuts in wood, drywall, and metal. You’ll be surprised at the ease of the cut. We did quite a bit of this in our Ridgid Jobmax Multi-tool review. The increased surface area of the half-moon blade helps you hold straight to a line while cutting quickly. 4. Strip, Peel, Scrape. Old paint, that “beautiful” old linoleum floor, unidentifiable gunk, and more can be removed easily with a scraping blade for a multi-tool. I’m sure you can think of at least three places to use this function right now. You won’t have to buy more elbow grease. 5. Remove Grout and Caulk. If you’ve ever experienced the joy of removing old grout and caulk for a bathroom remodel, you may not get to the end of this sentence before heading to the hardware store to buy a multi-tool. The oscillating feature makes this kind of work easy and efficient. The caulk will literally come right up, and experienced users will leave the material underneath largely unscathed. Just one more job made easy. 6. Undercut Doors. 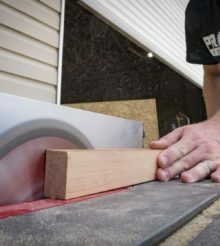 Perhaps the best way Pros use an oscillating multi-tool is for undercutting doors when tiling or flooring. We did quite a bit of this when we did our Pergo Outlast laminate flooring review. Get a good Japanese tooth blade when going after hardwood trim, and you’ll be done in no time. 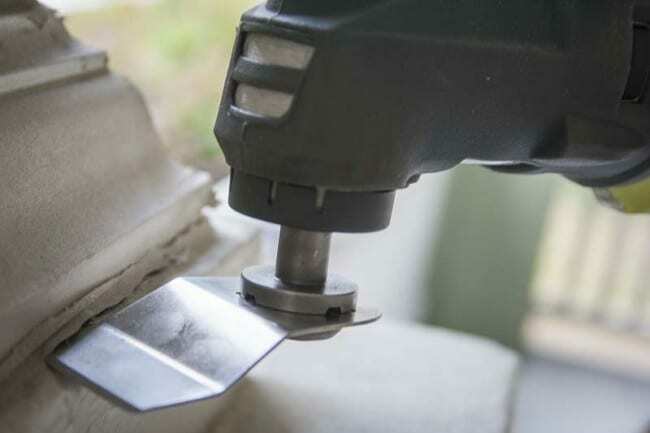 We hope you’ve gained useful knowledge from these 6 ways to use an oscillating multi-tool. If you’re a Pro and have oscillating multi-tool tips, add them in the comments below—or contact us with your own Pro tips. I recently used mine to modify an old Dewalt electric screwdriver case for my multi-tool that didn’t come with its own case. It had thick plastic cutouts to form fit the designated tool. My multi-tool cut through them with ease. After inserting some foam, it now stores my multi-tool and spare attachments and blades safely and securely.